Quantitative Comparison questions require you to make a comparison between quantities in two columns. You are to decide if one column is greater, if the columns are equal, or if no comparison can be determined from the information given. Quantitative Comparison tests your ability to use mathematical insight, approximation, simple calculation, or common sense to quickly compare two given quantities. This question type requires twelfth-grade competence in school arithmetic, algebra, and intuitive geometry. Skills in approximating, comparing, and evaluating are also necessary. No advanced mathematics is necessary. if the comparison cannot be determined from the information given. Common Information: Information centered above columns refers to one or both columns. A symbol that appears in both columns represents the same thing in each column. Choice D-the comparison cannot be determined from the information given-is not a possible answer if there are values in each column, because you can always compare values. If you get different relationships, depending on the values you choose for variables, then the answer is always D. Notice that there are only four possible choices here. Note that you can add, subtract, multiply, and divide both columns by the same value, and the relationship between the columns will not change. Exception: You should not multiply or divide each column by negative numbers, because the relationship reverses. Squaring both columns is permissible, as long as each side is positive. This section emphasizes shortcuts, insight, and quick techniques. Long and/or involved mathematical computation is unnecessary and is contrary to the purpose of this section. The rest of this problem should be done by inspection, because it is obvious that column B is greater than column A without doing any multiplication. You could have attained the correct answer by actually multiplying out each column, but you would then not have enough time to finish the section. The correct answer is B. Because both sides have the factors 2⁄5 and 5⁄8, you may eliminate them from each column. Because 33 is greater than 28, 3⁄7 > 4⁄11. The correct answer is A. Always keep the columns in perspective before starting any calculations. Take a good look at the value in each column before starting to work on one column. There is no need to do any calculations for this problem. Column A can be written (40⁄100) × 60. Column B can be written (60⁄100) × 40. You should note that both columns have (40 × 60)/100. The correct answer is C.
It is evident that 28 is much greater than 49; the correct answer is B. Approximating can also be valuable while remembering to keep the columns in perspective. As you keep the columns in perspective, check to see if the value in each column increases or decreases from the starting point. In Column A, a fractional value (a value less than 1) is multiplied by itself many times. So its value becomes increasingly smaller. (For example, 1⁄2 × 1⁄2 = 1⁄4; 1⁄4 × 1⁄2 = 1⁄8, and so forth). In Column B, a number greater than 1 is multiplied by itself; its value grows larger. So Column B is greater. The correct answer is B. As you keep the columns in perspective, notice if the signs (+, −) in each column are different. If they are, you don’t need to work out the problem. A negative number multiplied an even number of times will yield a positive product. A negative number multiplied an odd number of times will yield a negative product. Since Column A will be positive and Column B will be negative, A is greater. The correct answer is A. Subtracting in Column A, you get .05 − .125 = −.075. Our difference is a negative number. 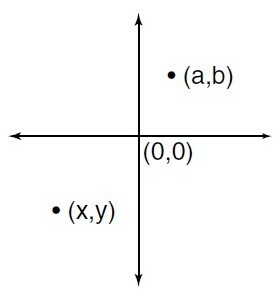 Thus, the positive value in Column B must be greater. The correct answer is B. Because coordinates (x,y) are in quadrant III, they are both negative, so their sum is negative. Because coordinates (a, b) are in quadrant I, they are both positive, so their sum is positive. Therefore, Column B is greater than Column A. The correct answer is B. The use of partial comparisons can be valuable in giving you insight into finding a comparison. If you cannot simply make a complete comparison, look at each column part by part. Because finding a common denominator would be too time consuming, you should first compare the first fraction in each column (partial comparison). Notice that 1⁄57 is greater than 1⁄58. Now compare the second fractions and notice that 1⁄65 is less than 1⁄63. Using some common sense and insight, if you start with a larger number and subtract a smaller number, it must be greater than starting with a smaller number and subtracting a larger number, as pointed out below. Often, simplifying one or both columns can make an answer evident. Using the distributive property on Column A to simplify gives ab and ac; therefore, the columns are equal. The correct answer is C.
Multiplying column A gives (3a)(3b)(3c) = 27abc. Because a, b, and c are all positive values, 9abc will always be greater than 3abc. The correct answer is A. The prime numbers between 3 and 19 are 5, 7, 11, 13, and 17. The correct answer is C, since there are 5 primes. If a problem involves variables (without an equation), substitute in the numbers 0, 1, and -1. Then try 1⁄2, and 2 if necessary. 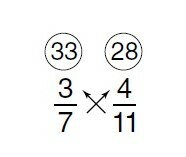 Using 0, 1, and -1 will often tip off the answer. Therefore, 0 > −1 and the answer is now A. Anytime you get more than one comparison (different relationships), depending on the values you choose, the correct answer must be D, the relationship cannot be determined. Notice that if you had substituted the values a = 4, b = 5; or a = 6, b = 7; or a = 7, b = 9; and so on, you would repeatedly get the answer B and may have chosen the incorrect answer. The correct answer is D.
Because different values give different comparisons, the correct answer is D.
Using these values, 9⁄2, or 4(1⁄2), is greater than 3, so Column A is greater. 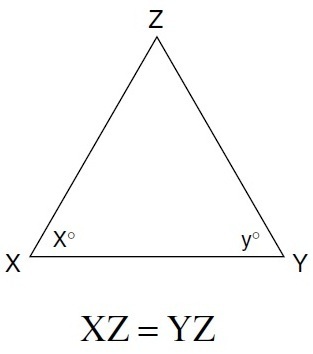 Using other values such that x > y > 0 will always give the same relationship. Column A is greater. The correct answer is A. Sometimes you can solve for a column directly, in one step, without solving and substituting. If you have to solve an equation or equations to give the columns values, take a second and see if there is a very simple way to get an answer before going through all of the steps. Solving for x first in the equation and then substituting would also have worked but would have been more time consuming. The correct answer is A.
Redrawing and marking diagrams and figures can be very helpful for giving insight into a problem. If you are given a diagram or figure on the screen, quickly redraw it on your scratch paper. Remember that diagrams and figures are meant for positional information only. Just because something "looks" a certain way is not enough reason to choose an answer. Even though x appears larger, this is not enough. Mark in the diagram as shown. 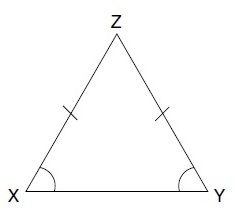 Notice that you should mark things of equal measure with the same markings, and since angles opposite equal sides in a triangle are equal, x = y. The correct answer is C.
If you are given a description of a diagram or a geometry problem without a diagram, you should make a sketch. When in doubt, “draw.” This may tip off a simple solution. The perimeter of a square with side 4x is 4(4x) = 16x. If you are given information that is unfamiliar to you and difficult to work with, change the number slightly (but remember what you’ve changed) to something easier to work with. 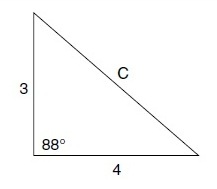 Becasue the 88° shown in the figure is unfamiliar to work with, change it to 90° for now so that you may use the Pythagorean theorem to solve for c.
Check to see if you actually have enough information to make a comparison. Be aware of the information you are given and what you need. Because no information is given for the amount of time each of the airplanes was traveling, no determination can be made about their distances traveled. You cannot assume that each airplane traveled the same amount of time. The correct answer is D.
The correct answer is D. Because the height of each right circular cylinder is necessary to obtain the volume, no comparison can be made. On occasion, you will actually have to solve information centered between the columns or information in the columns. You should be able to work these quickly. Remember, if it takes too long, you’re probably doing it wrong. Quickly plug in the values given. Therefore, B is the correct answer. m and n are integers. After taking a careful look at the center information, you realize that you’re limited in the numbers that you can use for m and n. Try some possibilities within these limitations. So when you use these numbers, Column B is greater. So when you use these numbers, Column A is greater. The correct answer is D, no comparison can be determined. Remember, anytime you get more than one comparison (different relationships) depending on the values you choose, the correct answer is D, the relationship cannot be determined. Most Suitable "One word "